Since 2006, we have placed over 235 infants and toddlers in loving Angels homes - and we could not have accomplished this without your support! 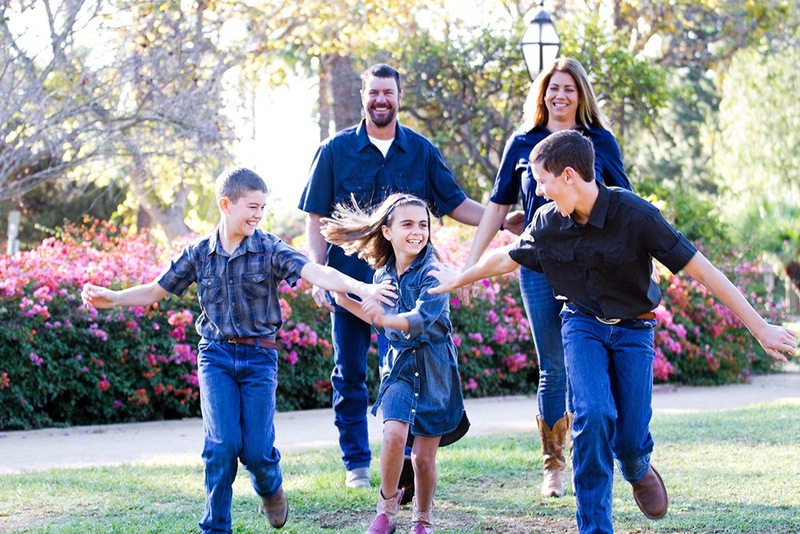 The Ortegas who are the first family to complete an Angels adoption! 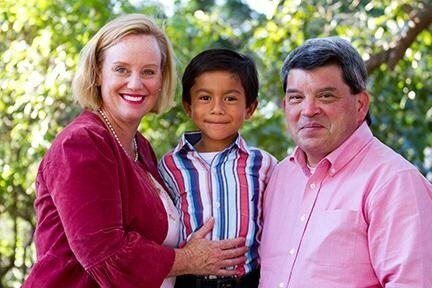 The Ortegas became foster parents to Jacob when he was two days old and finalized his adoption in 2008. Since then, Lucy and Frank have also cared for several other Angels children in short-term situations until they transitioned into permanent placements. Lucy describes Jacob as kind, empathetic, bright, funny, confident, humble and a natural born leader. He excels in every sport he plays. Recently Jacob wrapped up a successful Youth Football League (YFL) season, scoring thirteen touchdowns for his team, the Spartans, and playing in the championship YFL Superbowl. He challenges himself to aim for his very best. He is also gifted in music and singing, and has played the violin for three years and the cello for one year. In recent years, Lucy has served as a member of Angels' Advisory Board. 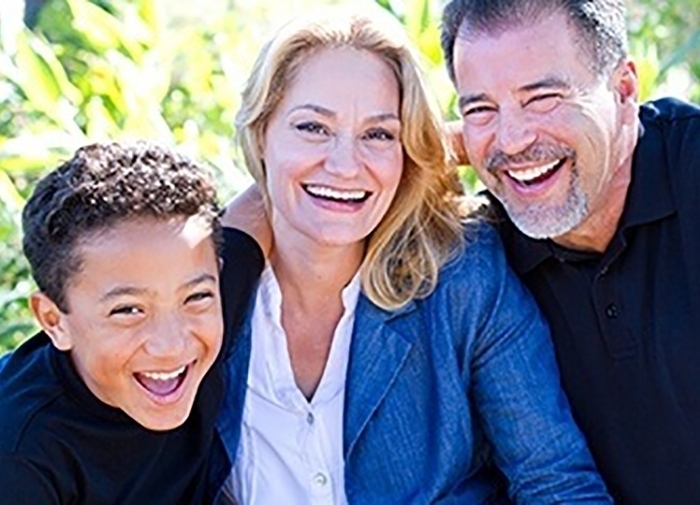 Through her work in the medical community, she has encouraged numerous families to explore foster parenting as a different path to parenthood and adoption. When reflecting back on her fostering experience with Angels, Lucy adds, "The Angels staff was loving, kind and supportive throughout every step of the foster-adoption process. Everything with Angels has been amazing and meaningful." Congratulations to the Ortegas for being part of a major milestone in Angels history! Angels is very grateful to the Davenport family for being Angels Foster Care's first foster family! 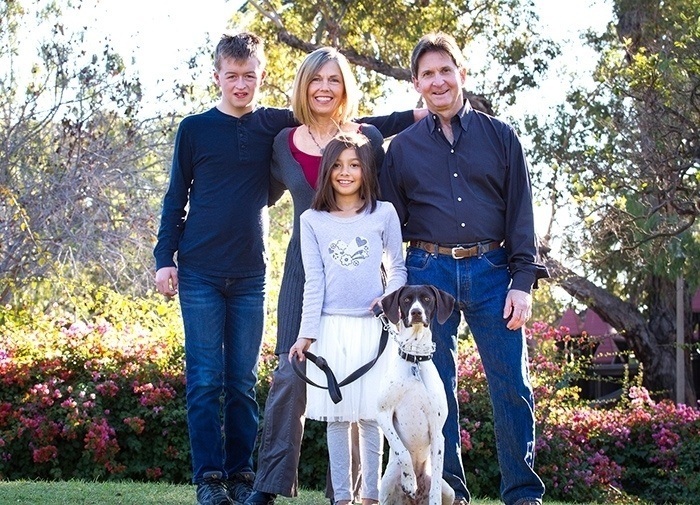 Alan and Claudia Davenport became foster parents in October 2006 when they accepted placement of a one-year-old girl. Though there were many ups and downs, they remained committed and helped their young foster daughter successfully transition when she was eventually reunited with her birth mother. Claudia recalled, "We wanted a second child, but over time we became committed to the idea that we should foster regardless of the outcome. It became clear that this was the path in front of us." A short time later the family accepted placement of a newborn girl, Lola, who joined the family and became a sister to their son, Jackson. After 2 ½ years in care, Lola was adopted by the Davenports in 2009. Now almost nine years old, Lola is bright, empathetic, perceptive, and makes friends easily. She loves to read, enjoys school (particularly the natural sciences) and is a member of 4H. She loves all forms of dance (ballet, tap, flamenco and especially hip hop). She would like to become a marine mammal vet when she grows up. When reflecting back on her fostering experience with Angels, Claudia adds, "The most meaningful part has been connecting with the babies. Taking care of them, seeing them respond, and falling in love with them for their unique selves." Thank you to the Davenports for their years of service! Photo: Back Row: Jackson, Claudia and Alan. Front: Lola and her dog Holly. Scott, Chelsie and Kate Luebke finalized Kate's adoption late in 2015 when she was 21 months old. 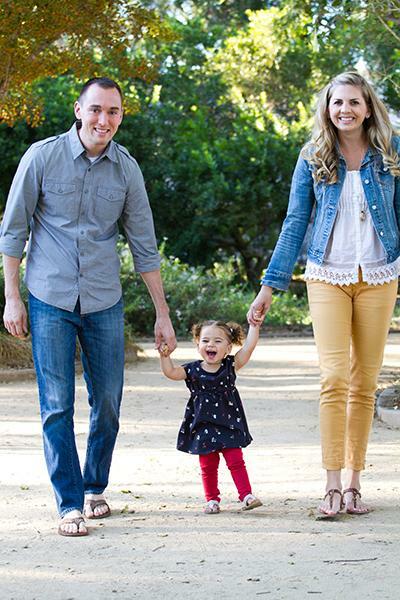 Scott and Chelsie wanted to create a family and knew adoption would be the way for them. After learning about the Angels Foster Care program, they decided this would be the way they could grow a family. They consider Kate the most precious gift they have ever received. They consider their road to adoption a long one but they would not have it any other way. The most meaningful part of the fostering experience was getting to watch Kate grow from the very beginning. Kate's contagious personality made the whole experience joyful and watching her smile makes everyone around her want to smile! Kate is now almost two and is a loving, happy baby who is very social and loves to give hugs and kisses! She is also smart, feisty, strong-willed and her mother describes her as passionate. Kate has a special love for animals so Scott and Chelsie wonder if working with animals might be in her future. Right now, Kate's days are filled with reading, especially Winnie the Pooh, playing with dolls, riding her stuffed animal horse, coloring with crayons and visiting the giraffes and flamingos at the zoo. She's also very helpful in the garden harvesting tomatoes (which she eats right off the plant) and smelling the flowers. have a busy, active family and have always enjoyed parenting. Their two older children, Jessica and Nick, are now in college. Robert and Julie always wanted to adopt and give a child a loving home. They bonded with baby David immediately and have enjoyed the love and energy that a young child brings. Julie describes David as sweet, happy, funny and loving. She says he enjoys looking at trees and fish, spending time with his big brother Nick and big sister Jessica, watching sports with Robert, and rocking in the rocking chair with Julie. He is strong and active, and began rolling over at 2 1/2 months. When he is an adult, Julie predicts David will be a strong man of God and probably interested in sports and music. "We feel very blessed to have David in our lives," says Julie, "We are all so in love with him and he brings us so much joy." Cagney and Elijah have played an important role in caring for their Angels sisters, learning first hand how to convey patience, tenderness and love with their little siblings. Meah, who joined the family in 2012 and was adopted in 2014, is outgoing, creative and energetic. When she first came to the Herrick family, Meah was more comfortable in a car seat than in their arms. But over time with the family's love and support, she learned to enjoy being held and making eye contact, Now she is well spoken and never afraid to give her opinion. She loves to play dress-up and pretend, often taking on pirate, cowgirl, doctor and princess roles. She takes ballet and tap classes. Confident and bold, Meah's smile lights up a room. Angi says one day she could be a doctor or even president! In 2014, the Herricks welcomed baby Natalie to their family. Angi characterizes Natalie as their little ray of sunshine who is sweet, joyful and always ready for a cuddle. Natalie's favorite things include kitty cats, music and the song "Row, row, row your boat." 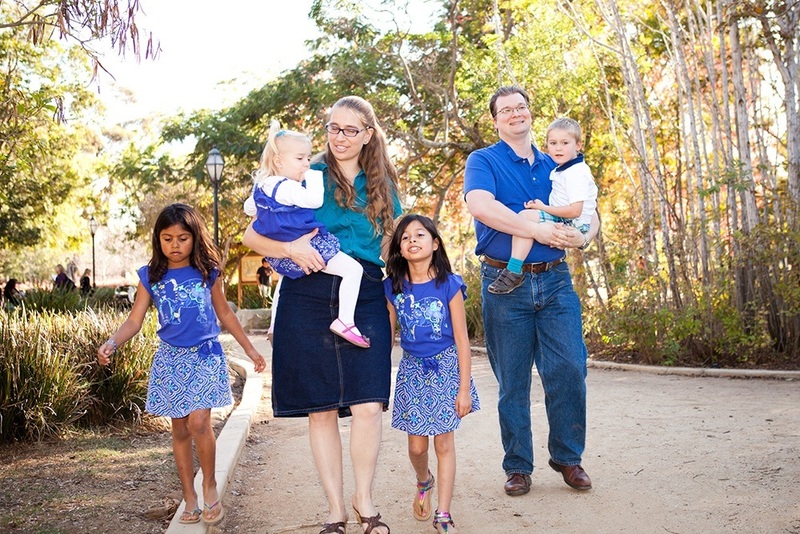 In recent weeks, Natalie's adoption was finalized and the Herrick family was able to embrace her as a permanent member. Angi and Jay describe their motivation to become Angels parents as a love for babies and a desire to provide a safe and stable place for children to stay until they could be reunited with their families. The most meaningful part of their experience has been watching the growth and changes in their Angels children, and how they have overcome unique sets of challenges to blossom. affectionate and has a sly twinkle in his eyes at all times. He is very family-oriented and his favorite place to be is home. Although separation anxiety, fear of abandonment, and limited vocabulary were big hurdles early on, he has since blossomed into an enthusiastic Kindergartner who earned "Student of the Month" during his first few weeks of elementary school. Tommy loves to read and be read to, play board games and puzzles, and be with family. He also enjoys Karate, swimming, basketball, tree climbing and backyard play. Kelly's recalls the most meaningful part of being an Angels foster parent was watching her child flourish and become the person he was meant to be once he got the love and stability he needed. She has marveled at Tommy's intuitive nature and nurturing with regard to babies and animals and wonders if someday he will choose a care-giving profession. Thank you to the O'Neill family for welcoming Tommy into your hearts! Christy and Johnny first learned about Angels from a 2006 newspaper article about a new start-up foster care agency Angels Foster Care-­in the Santa Barbara News-Press. After speaking with Meichelle Arntz (Angels' founder and Executive Director) about the need for foster parents in our community, and her passion for helping vulnerable children, they were hooked. After becoming certified, they joined the first "class" of Angels Foster parents and welcomed baby Annabelle into their home in 2007. Christy and Johnny had two young sons who were excited to have a baby sister in the home and the whole family was thankful for the support of Angels social workers during the two years they fostered Anna leading up to her adoption in 2009. Christy recalls the most meaningful part of their fostering experience was providing a loving home to a sweet baby that needed a home. She also enjoyed the knowledge she gained about the foster care system, which allowed her to share her story with others and encourage them to explore the idea of becoming a foster parent. Over the last few years, she has had a few friends join the Angels family. It has been an amazing feeling to watch a family grow while providing a much need home to a baby. Annabelle, now 9 years old, has a strong, fun-loving and somewhat silly personality and is constantly making the family laugh. She is a sweet, loving and intelligent girl who loves Flamenco dancing, soccer, softball, singing and music. When at home she loves joining in with her brothers in whatever they are doing, or enjoying classic cars with her dad including cruising in his El Camino. With her leadership abilities and strong personality, Christy says Anna's interest in being a police officer could be a great fit. On the other end of the spectrum, Anna's love for animals might translate into a veterinarian career someday. Whatever she chooses, Christy says she will be great! sister" was 2 1/2 and Madison was 1 1/2 when they joined Ashley and Jason's home. Both girls received the love, attention, and healing that they needed and the Millers flourished as natural parents! Eva was 5 and Madison was 4 when their adoptions were complete in 2012. With the care, support, and guidance they got from the Angels Social Work team, and everything they learned through their first foster, then adoption, experience, when Angels got a call that a baby boy needed a home, the Millers, again, said yes! Austin joined his family in 2012 when he was 14 months old. The Millers loved him, took wonderful care of him, and were very supportive when the plan for reunification with his biological mom was taking shape. Together, the Millers and his bio mom developed a relationship and worked together to transition him back to his bio family. 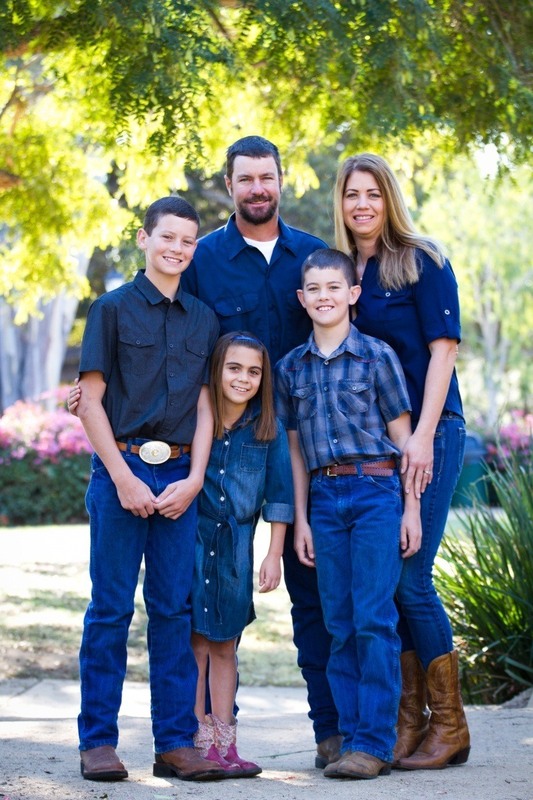 When the reunification did not, ultimately, work out, the Millers were able to welcome Austin back into their home and his adoption was complete in 2015 when he was 4 years old. In the meantime, they welcomed Anastasia through birth so now their family of 6 is happy, busy and full of energy. Jason and Ashley even sit on foster parent panels during our Foster Parent training classes to share their vast and varied experience with foster care and the Angels model. The Millers have worked hard to make sure their children have adapted and healed from some of the early childhood experiences they have gone through. Eva, in particular, has needed some special accommodations to help her anger dissipate and help her to trust. She is almost 10 years old now and is becoming a loving and respectful child. Her artistic streak and interest in crafting is a blessing and her love for other children and being a teacher is wonderful to observe. Ashley thinks Eva might even put her "mothering" nature to work with foster children, herself, one day. Madison is the silly sister and is quite an extrovert. She is always on the move and is very athletic enjoying running, gymnastics and swimming. Recently, Madison's struggles with school revealed she has a learning disability so with the help of her school and an IEP she is getting the special help and extra attention she needs so is improving academically. Her parents wonder if she might become a physical therapist one day but know that whatever she does she will do it with a smile. Austin overcame some very early developmental delays and is now a very bright 5 year old who is flourishing with learning. Ashley says he is a "sponge" that soaks up everything. He learns quickly and loves to experiment and plays legos, board games and card games with his family. He is "all boy" and is very active, loving to play outside. His parents are pretty certain he will be some kind of engineer and Jason can not wait to teach him to write computer code. 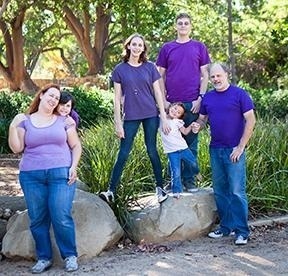 The Miller family are a wonderful example of how foster care experiences can be varied and unique but their concern for children and their desire to help is an example and inspiration to others. Their deep relationships with their children is the most meaningful part of their fostering experience. The love they share has made all the struggles and heartbreak worth it!